Man, 2007, you were the garden of forking paths of years. Every time I try to stop and take stock of you I'm looking at a different year, like cross sections of a rock where all years are possible. Sometimes when I look at you you were the hardest, and sometimes you were the best, and in the places in between you were both in varying doses. I'm all mixed up about how I've felt about you. December, certainly, has been a very hard month. The way the year is ending couldn't be more different than the way it started. My brain has felt softened this month, and everything has made me go all damp in the eyes. I have felt broken and incomplete and like a deep sea creature that might explode if brought to the surface. I spent a good part of the year with what I can only describe as a broken heart, and in attempting to distract myself and recover I did a lot of things that surprised even me. And that was the part that was terrible--the surprise of feeling any such thing, since it snuck up on me, and all of the wrenching feeling that went with it. I spent much too much time this year trying to pretend that none of it was happening. But that isn't the important part. And it's funny, because if things had gone the way I thought they might in January, everything would have been so different. So it's a good thing that life is smarter than me and also in charge, because I had so much fun this year. And that's what's important. There were Tuesday nights and Sunday brunches at Linda's, trips to New York and Vegas, driving fast around corners, rollerskating, drinking in the sun, the speakeasy, my ship in a bottle, drinking champagne and playing in the bubbles in a fountain, kissing lots of boys, falling in love with bands, obsessing about nature documentaries, a hot tub full of Swedish boys, and a ton of nights where I felt completely full of glitter. I think that I was more myself this year than ever before, less afraid. I've spent my time with people who don't look away when my edges are showing, and I'm thankful for it. The unofficial motto of 2007 was Sleep When I'm Dead, and the results were ridiculous and amazing. I think that it can be summed up like this: when Giacometti painted a portrait of James Lord he painted and repainted the canvas over eighteen days. In the finished piece Lord's head is detailed and accurate but the background and the rest of his body is merely sketched in. When it was finished he sat it down and walked down the hall to look at it from a distance and said, "Well, we've gone far. We could have gone farther still, but we have gone far. It's only the beginning of what it could be. But that's something, anyway." But then there is also e e cummings: "Miracles are to come. With you I leave a remembrance of miracles: they are by somebody who can love and who shall be continually reborn, a human being....Always the beautiful answer who asks a more beautiful question." And somewhere between those two is 2007 and, with luck, more years to come. My trip went well, and it was lovely to see my family, but it doesn't take very long before I start to miss the long quiet walks and empty spaces of my life in Seattle. I have been much too fragile and deeply blue lately to deal gracefully with the game of psychic dodgeball that is spending time with my family, and I'm unaccustomed to the level of noise. Last night I came home after a couple of very delayed flights. The luggage took forever to arrive, and I stood there with my sweater coming apart at the sleeves and the rest of me fraying at all of my edges, overwhelmed, and considered leaving my suitcase at the airport. I didn't, but I probably should have. In any case, it is nice to be home. I'm starting to work on summing up 2007, but in the meantime here's 2007 in pictures. The set itself is here, if you want captions, and this is an alternate version that includes other people's pictures. Variety being what it is and all. Merry Christmas, internet. I hope all of your Teenage Mutant Ninja Turtles are the best ones. The airport shuttle driver and her GPS argued the whole drive. Whenever the GPS would tell her to turn right she would turn left, and the machine would wait a minute before announcing that it was recalculating the route. By the time we made it to the freeway, the little electronic voice had fallen petulantly silent. It didn't pipe up again until we had been stuck in traffic for a while, when it told us that we were approaching slow vehicles. In the van we sat frustrated by the stop-and-go traffic and listened to the one-sided conversation of the dispatcher on the radio. "Are you completely lost or is your van not working? Help me out here." A long pause. "You're completely lost? Well can you read a street sign and tell me where you might be?" Pause. "Ok, who wants to go on a rescue mission?" Later, he advised the other drivers to avoid the interstate. "No one's getting anywhere, so good luck if you go that way." At this point the other passenger in the van and I spoke up. "He does know that we can hear him, right?" After an hour and a half of hardly moving we passed what was left of an awful accident. A crumpled car with the top sheared off was being loaded on to a tow truck on the left side of the road. I felt a little foolish for worrying about missing my flight. It could have been worse, and it frequently is. I did miss my flight, but a sympathetic ticket agent worked some magic and found another flight that involved running through the airport with my shoes untied. My connection in Charlotte was on the other side of the airport and, sleep deprived and tired of running, I found myself annoyed with the smugness of the airport and its rows of rocking chairs. Charlotte was mocking me and my rushing, the lack of time I had for rocking. I am slowly planning a trip to Italy in the spring. It'll be my first time there, and, for that matter, my first time in Europe--the only place I've been is China. I'm sort of an obsessive researcher and planner, and at the same time I'm trying to avoid all of those impulses. I had no plan for China, mostly because I was visiting friends, so I just sort of showed up at the Jinan airport and waited for entertainment. So I'm torn between working out a detailed itinerary and just sort of showing up in Rome and going from there. My compromise will probably be a loose sketch of what towns I'm planning to be in and when, so that I can make reservations, but right now it's a big fight inside my head. More immediately, I'm leaving tomorrow evening for parts East, to watch my brothers argue and to scratch behind the ears of some dogs. They live in the woods, and woods make me nervous, so I imagine I'll spend a lot of time pretending that I don't believe that there are axe murderers hiding behind all of those trees. We rushed past all of the scenery because it looked like only trees. By the end we had forgotten both the journey and the destination, and we stood, lost, in an expanse of white space like the end of a chapter in a book. One written in a language that we didn't speak. I wanted you to go away because you made my brain feel like laundry. In quieter moments, waiting for the neurochemical tide to turn, I wedge myself into nooks and stare fondly at copy errors in my antique books. I love these misplaced letters that have sat quietly in those pages for a hundred years. The person who printed them wrong is likely long dead, but their mistakes have lived all this times on shelves in people's homes. I like to hope that my mistakes will be so lucky. Not too long ago someone emailed me suggesting that, if I'm stuck for stuff to say, I should start telling stories about the objects in my apartment--since pictures taken here and put in my Flickr would suggest that I have a lot of things. Which is true enough. I don't believe in clean, modern decorating. I spend a lot of time here, and I like my apartment to feel like home; to have my stories scattered on shelves and walls and everywhere else. I've been hemming and hawing about it ever since (hemming and hawing are two of my greatest skills), but the thing is that December has been awful and just keeps getting worse, and all I'm good for right now is complaining and drinking. So I thought I'd give it a shot. 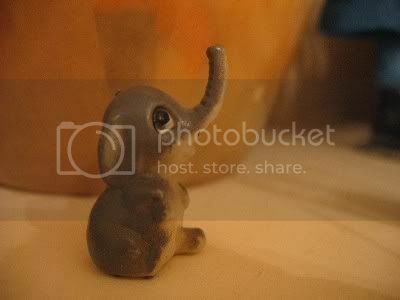 And I thought I'd start with this little elephant. My paternal grandmother, my Nan, collects elephant figures. A number of years ago, right around when they first diagnosed her with Parkinson's disease, she requested that I pick one of her elephants to keep. He's maybe 1 1/2" tall and he lives on top of the bookshelf that has all of my reference books, right next to my desk. My grandmothers are important ladies, and it makes me happy to have reminders of them right on hand whenever I need them. I promise to have actual content for you soon. I've been reeling a bit this week from Anita's death on top of everything else, and it's all left me with little to say. Ellen: "You started in Florida and are now in Seattle but it seems you've been some places in between, and yet you're approximately 12 (okay, 25?). Please make a timeline of the cities/town you have lived in from birth until now." Pinellas County, Fl, 1985/6ish-2000. 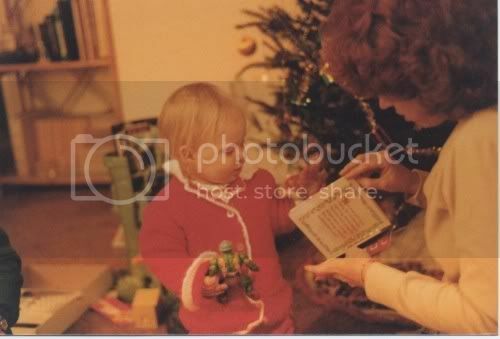 My parents divorced when I was very young, but they always lived within 20 minutes of each other. My whole family lives there, too, pretty much. I lived with my dad every other weekend until my brothers were born, and then it was more like every weekend until I moved in with them completely during my senior year of high school. My dad and stepmom moved around quite a bit when I was growing up, but always in the Largo/Clearwater/Dunedin area, and my mom moved once, right before my sophomore year of high school. Now my dad and his family live in North Carolina, but they just moved there a few years ago. And my mom intends to move to the woods in Georgia at some point in the near future, but I've never lived anywhere else. And more! I'm just editing this post instead of making a new one. Just to shake things up. M: "What size shoe do you wear?" Usually a 6 or 6 1/2. I have giant feet for only being 5' tall. You'd think my balance would be better. "And what three things, besides Thanksgiving, make you happy?" 1. The moments when I realize that wherever I am and whatever I'm doing, I wouldn't want to be anywhere else doing anything else with anyone else. 2. Scratching behind the ears of friendly dogs. Keith: "You mentioned 'pen and paper'. Do you prefer to write with a pen or a computer?" Depends on what I'm trying to write. I write differently here than I do in my paper journal, just like how my handwritten letters are vastly different than emails. And the typewriter is what I use when I'm too annoyed for pen and paper to be forceful enough. Mostly, I use pen and paper for the sort of things that I don't write about here, when there's too much feeling for me to be comfortable. The paper journal and this one are two completely different ways of thinking, and there are two totally different voices involved. It's a lot like being textually schizophrenic, so the fact that both options are there is good. And I prefer to write my letters personally because it's a slower process, so each letter is a little act of devotion toward the person I'm writing to. Jake: "Heavy partying is certainly a good reason for not posting more. Does this mean we should hope for depression and a downturn in your social life in order to get more posts?" Really, what you should hope for is a downturn in my social life and a case of the Delicately Blues, because depression does nothing for me. December has been pretty relentlessly awful, and that's reflected in what I've been posting, which has been uninspired. I'm at my best when I'm just a little bit sad and wistful. Amon Ra: "Sum up the experience using no more than 3 haikus." Huh. This game is kind of fun. Alright. Brandon: "If you were a boy and wanted to impress a girl, what would be the absolute most fantastic question you would ask?" Um. 'What's your ring size?' Kidding! Kidding. Although someone did ask me that at a bar once, and I was so appalled that I couldn't even collect myself enough to say something mean. I had a dream the other night in which two nice-looking boys were sitting at a bar, and as I walked past one of them stopped me and asked, 'I'm sorry, but could you help us solve this argument? We're talking about the mimic octopus. Do you know how many creatures it can imitate?' I'm a little concerned that I'm dreaming about cephalopods, but I'm also pretty sure that if something like that actually happened, it would be makeout gold. Ryan: "I've always wanted to know if your vignettes are planned and worked on and edited or if they just kind of tumble out of you in the form they arrive in on your blog. Or, perhaps, a combination of the two?" I don't edit. I can't edit. What happens when I edit is I go from overwrought straight to stilted. The way this website tends to work is that I get a sentence stuck in my head like a really annoying song, and as soon as I can I type it out and then sort of go with whatever makes sense next. Which actually gives a pretty accurate picture of what it looks like inside my head, because things like this make total sense to me. It's all a lot more like coughing up a hairball and less like, you know, actual writing. 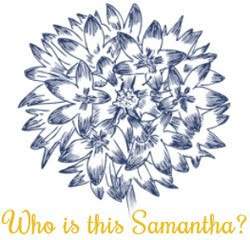 Rob Lightner: "Does Samantha the character secretly resent the intrusions of Samantha the author? Does Samantha the author want more, or less, or something different, from Samantha the character? This reader has enjoyed his interactions with both, though it's been far too long for the one. Are you a happy couple?" I actually really hate the whole writing compulsion thing--I always refer to Nietzsche when people ask me this question, and his, 'A: I am annoyed by and ashamed of my writing; writing is for me a painful and embarrassing need, and to speak of it even in a parable disgust me. B: But why, then, do you write? A: Well, my friend, to be quite frank: so far i have not discovered any other way of getting rid of my thoughts.' Samantha the character wishes that samantha the author would just shut the hell up already, because it would be nice to experience something without automatically thinking about how I could describe it, or figure out how I feel about something without writing it out. And I imagine that samantha the author wishes that samantha the character would quit whining. So, you know, not a very happy couple. Mike: "What do you look like? Why do you never post pictures of yourself, since this is such a personal blog?" I look like a Muppet. Specifically, this muppet. And I don't post pictures of myself here because no one needs my giant muppet head on top of all of this general gnashing of teeth. But the internet is chock full of pictures of me--five days old, fourteen, seventeen, this summer, wearing glasses, kissing a girl under an umbrella in a bar, two weeks ago. There are plenty, and those are just from me. One thing the world is not lacking is pictures of me. Jake: "How come you don't post more often? Some weeks you only have a few posts. I know its probably hard to keep up such a high quality but when you do post daily (as you have recently) its a very cool thing." It's a complicated algorithm involving free time and inspiration. I'm out four or five nights a week usually, for live music or drinking or dinner or general carousing, and it doesn't leave a lot of spare time. And of course when I'm dating someone, which I was recently, there's even less free time. Plus, when I am home, I'm usually too tired to do much beside lay on the couch. Sometimes I just have nothing to say. I don't always let that stop me (ok, I don't usually let that stop me), but now and then I feel like I have already used all of the words I know in every possible combination, and there's nothing left. Or maybe I'm working on something for someone else, and that's using up the voice I usually use here. I try to stick to posting at least every other day, but sometimes it doesn't happen. Dylan: "Why do you write?" Because, like Norman Mailer's friend said, 'The only time I know the truth is when it reveals itself at the point of my pen.' Because I don't know how not to. "Are you looking for love in all the wrong places, or are you looking for places in all the wrong loves?" I'm not really looking for love. I go out with lots of people, because I like kissing, but mostly I'm pretty fond of being single, although I guess if it happened I'd be into it. I just want to get drunk, make out, and talk about books, and probably some day I'll do that with someone and realize I'd like to keep it up for a very long time. There are a lot of different kinds of love to have fun with, and I am surrounded by them. Maybe love is something I'll just trip over like shoelaces. On the other hand, I am probably looking for places in all the wrong loves. "How would you describe your relationship with your ten year old self?" My ten year old self and I are probably on pretty good terms, because at the bottom we're both the exact same scared little girl. I know a lot more about some things than she does, but then, she probably knows a lot more about other things than I do. Of course, she gets made vicious fun of a lot more than I do, but that's only because I have since learned about kicking people. That was amusing. Anyone else? Alright, so here's what's been on my mind lately. (I mean, aside from how sick and tired I am of being sick and tired, but how I wouldn't mind keeping this low, kind of sultry voice...) I've been at this for four years now, and in that time I've gathered you, this collection of readers, who are an interesting combination of people I do know and people I do not know. And you are not commenters so much as you are emailers, and as a result I've gotten the most random selection of questions and things emailed to me, but remarkably little of that sort of stuff in the comments. So in these four years I've been doing all of this for me, without considering who my audience might be or what they might want, because this is an outlet for me like none of the others, and I've found no better way of clearing out all of the sentences that get stuck in my head. And I have no intention of stopping that. But I've been thinking about you, and our relationship, and all of the summing up and considering that go with the end of the year. And I've never done this before, but now that it's on my mind I have to see it through, so: is there anything you want to know that I haven't told you? Maybe after four years, it's time for an "ask me your questions" post. Someday, I should probably analyze why this makes me so nervous. Today my acupuncturist put some things in my forehead. I'm sure this is old news for lots of you, but I've never had a needle in my face before. It was a surprisingly itchy experience. Afterwards, I detoured through the park to spend a few minutes on the swings. I've still got this epic trial of a cold--have had, for about a month now--and my voice is all shot, and I ought to have gone straight home to do my laundry and have soup and whiskey and watch Gregory Peck be the only possible Atticus Finch. But I'm never one to pass up a race on the swings. I am still the champion of swinging the highest. I've been feeling very deflated and bruised and broken lately. Yesterday I rode home on the bus through the dark, my spine gathered tight and hollow, my voice beginning to crack from a cold. The bus pulled up to a stoplight and shuddered to a halt and I looked out the window through my reflection. Across the sidewalk and through another window a group of people were gathered decorating a Christmas tree. A little girl put a string of lights around her neck like a stole and struck a pose, and the people all dissolved, laughing. Just then the light changed and the bus slid away and "Handle With Care" came on my headphones, and I snuggled deeper into my scarf and defiant green coat. Later, I walked through piles of leaves to a cocktail party full of strangers. There were no cars parked along the curb, and piles of shattered window glass glittered in the streetlights. From the looks of it, all the cars in the neighborhood are missing their windows. Some nights, all of my steps kick up clouds of strained metaphors. Happy 4th birthday yesterday, website. Let's you and me stay friends for a long while. I was reading today about a study that some scientists did on Beethoven's hair, which turned out to be full of lead, which was probably what killed him. The lead, not the hair. But what really got me is this talk about the lack of trace-metal patterns that are associated with all manner of things like genius and irritability and malabsorbtion, which just slays me. What metal gives you the genius? And if Beethoven didn't have the metal-genius, what sort of genius did he have? The hair that they studied was cut off his head by a young Jewish musician whose family kept it as a keepsake until the Nazi occupation, when they gave it to a Danish woman who helped a whole lot of people escape, and her daughter auctioned it off at Sotheby's. You know, I do this to people in conversation too, where it's a lot less easy to escape. I just find everything in the world very, very interesting, is all. This sounds like it would be very endearing and cute--I'm a pretty endearing and cute girl, by most accounts--but it really isn't. It might be, if I could work these things into a conversation like a normal person, but instead I remember halfway through talking about something else that I'd been thinking about this neat thing, and I flail around and shout about it right in the middle of whatever is going on. So it's really only amusing for people who already know me. Strangers just think I'm nuts. Anyway, that made me think about Newton, and about how he (once? often?) stuck a knife behind his eyeball to "induce ocular effects," because plain old drugs just weren't good enough for him. But it could easily have blinded him, and then where would we be? If an apple falls on Newton sitting under a tree, and he's severed his ocular nerve and can't see it, does he discover gravity? These are the things that keep me up at night. I have this bad habit of weaving when I should be ducking and ducking when I should be weaving--poor emotional reflexes. This last couple of weeks have knocked me off balance, and I am officially discouraged. A few days ago I was walking home in the dark, and crossing the street I looked the other way where I usually don't. Down the street the docks and their shelters were lit, brilliantly, and I wondered how I've made that same walk all of these years without noticing it. Yesterday, I went the acupuncturist for the first time. It's a peculiar feeling, having needles in earlobes and ankles, but maybe it'll help shut my angry robot down. Well, internet, I went and bought a sewing machine today. It makes me laugh that it's a "Project Runway Limited Edition," because I love that there are actually people who would go and buy it just for that reason. I plan on covering that part up with a sticker, to hide my shame. 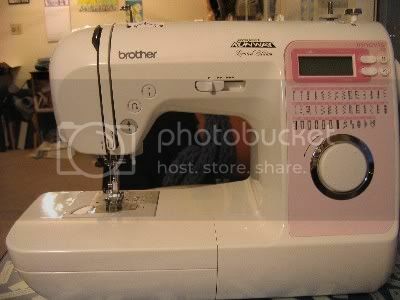 It was actually a very simple purchase--I walked in and told the man that I needed a sewing machine, he asked what my experience level was and what I planning on doing with it, and then showed me a couple of machines. It was all very pleasant. So now I'm going to become one of those girls who makes (some of) her own clothes. I'm very excited. 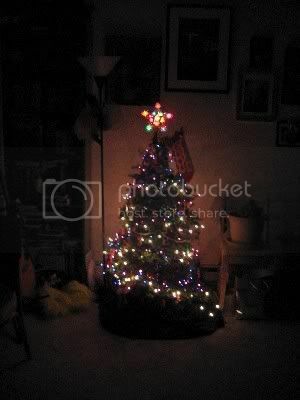 In 2002, I started the Postmodern Christmas Tree project. I did it because I was broke, mostly, but also because a Christmas tree was a symbol to me for something that I was lacking, and it seemed inappropriate to have one. So I decided that until I had a family, I was going to make a tree out of things that I already own--use the objects in my life to fill in that absence. But the thing of it is that I do have a family here. Not the sort that I had in mind when I made that decision, of course--in fact, this weekend's breakup puts me back at the farthest point from that I can get, which is fine--but a family nonetheless. A really great one. And it makes the sentiment behind the postmodern tree feel a little silly. So today a couple of my best ladies and I went to the tree lot and picked out real live Christmas trees. Once I made it home I turned up the heat and put on my favorite Nat King Cole album (I worked in retail for too many years to listen to Christmas music) and decorated it. My heart hurts a little, having been much used lately, but my tree makes me very happy. Retiring the postmodern Christmas tree was a good decision. I love snow in Seattle. Snow in Seattle is like meeting a beautiful stranger while on vacation and spending one perfect week with them. You never see snow here long enough to get annoyed that it leaves its socks all around or hates your mother or gets really bad PMS. Snow sticks around long enough to make an entirely new city for a day or two, and then it melts. As a girl who comes from a state with no natural ice, snow is like Christmas only better.